This has happened a few times now, with the fact that it has happened a few times being the result of the lack of meaningful action by the international community of nation-states. This current rise in our own attention to Darfur resulted from a few disconnected events: a quick back and forth about Darfur in the comments section of a post, a conversation with a friend of a friend at a party about the work she’s been doing to help organize an upcoming call to action on Darfur, and an HRW report that Janjaweed militia are attacking refugee camps in Chad and the Chadian army is no longer protecting many of the camps. The cycle has been iterated often enough that it seems unlikely that anything will be done—suggestions of NATO intervention included. In the midst of some back and forth in the comments section of the blog, I recalled a questioned posed by Daniel Davies over at Crooked Timber a while ago. Davies was commenting on an editorial about Sir Mark Thatcher’s alleged bankrolling of a coup attempt in Equatorial Guinea, which is run by a venal and brutal petty dictator—although no one was under the illusion Sir Thatcher was motivated by a desire to liberate the country. The serious issue raised by this joke is, if we accept the logic of the “strong version” of humanitarian intervention, then why should we also say that it is only the job of states to carry out such interventions? Since, ex hypothesi, any special position for states is ruled out by the strong pro-war internationalist liberal stance, why shouldn’t groups of private individuals take action? For example, Harry’s Place has five main contributors, each of whom could probably raise about $200,000 if they took out a second mortgage; maybe they should be ringing up Executive Outcomes and getting a few estimates in on smallish African states. Why leave this to the government? Certainly, mercenaries have been used before. Both Executive Outcomes and Sandline International were used in Sierra Leone against the remarkably thuggish Revolutionary United Front of Foday Sankoh, and they were apparently very effective and relatively cheap. (To make it perfectly clear, I’m not a fan of mercenaries, whom I consider slightly better than international arms dealers, whom I consider, by and large, parasites that feed upon the weakest member of our species.) The UN under Annan considered using Executive Outcomes in Rwanda in the face of the unwillingness of the international community to halt a genocide. Certainly, on the Left, one of the greater and more heroic images is of the international brigades that came to the defense of the Spanish Republic against fascists. (Yes, they were not mercenaries but idealistic volunteers, but that seems a technical difference rather than an ethical one. Idealist NGOs in this hypothetical would be hiring specialists, who I imagine are better at armed conflict than human rights workers.) In fact, if there was a problem in retrospect with the defense of the Republic, it was the involvement of the Soviet Union. I’m aware of the problems associated with NGOs raising money to hire mercenaries to intervene in humanitarian disasters: unlike with states, there is the problem of weak or absent institutions for exercising accountability, and that fact could thereby lead to more chaos; there is no transparency; there is the problem of precedent, in that do I want some alliance of radical anti-abortion forces in the world to raise money and take out a weak government which allows abortion because it believes it to be mass murder; there is the problem that it encourages mercenaries (parasites) by creating a demand for them; there is the fact that it is a crime in most countries to conduct this kind of private foreign policy; that the further privatization of certain services which are collective goods, the provision of which should be subject to democratic debate and monitoring, is the last thing that the world needs; and there are probably many more that don’t come to mind right now. Against this there is: the fact that Darfur is a catastrophe; that we are witnessing state failure, in the sense that those who are supposed to stop this sort of thing have failed to do so on enough occasions for us to believe that they won’t do so at all, and perhaps in the same way that individuals have a right to organize their own security if states cannot provide reasonable safety, perhaps we have a right to organize collective security when states won’t; that it is reasonable at times to commit a lesser crime to prevent a greater one; and that it would save a lot of lives. (While the figures come from Executive Outcomes and are probably very self-serving, it’s not unlikely that 1,500 EO mercenaries in Rwanda could have saved tens of thousands of lives.) Perhaps even more importantly, that there are instances which act as exceptions, where other principles weigh enough to suspend in that instance countervailing principles, and that by acting in this instance in violation of the lesser principle, we’re not nullifying it altogether. 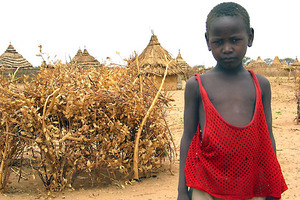 Darfur may be a reasonable candidate for such an instance. But this last part is just the pro side being the pro side. In all honesty, I don’t know how to weigh these against each other. I go back and forth, and I find that my best moral reasoning doesn’t seem to yield any kind of resolution to it.